Pitch Perfect star Anna Camp and lifestyle bloggers helped the brand promote its new line of simpler recipes with this campaign. Nestea wants consumers to see its new ready-to-drink tea lines as a simple choice. With the growing trend of austere houses and simple living attracting consumer curiosity, the idea to custom build a tiny house that encapsulates the new Nestea image was born. The campaign comes at the heels a major overhaul for the brand. Earlier this year, Nestea announced its move towards simpler recipes with a reformulated classic line and the introduction of a line of premium, real-brewed teas. "We heard from consumers that ‘less is more,’ so in addition to taking that advice on the product side, we were looking for a way to bring that mindset to life," explained Karen Ress, VP and GM of Nestlé Waters North America’s tea brands. The brand, along with Weber Shandwick's Team N, aimed to create a buzz with national media and consumers by offering a timely hook and compelling visuals for earned media. The Tiny House would also serve as a draw for consumer sampling at high-profile locations in cities selected for the tour. The campaign team also looked to partner with a celebrity spokesperson who could represent the brand, as well as several influencers to drive additional awareness of the campaign. The brand selected actress and singer Anna Camp, known for her roles in Pitch Perfect and Mad Men, as key spokesperson for the campaign. In mid-May, a media and consumer event was teased on Nestea and Camp’s social channels. On May 17, the 200 square-foot Tiny House opened to the public in New York City. That same day, the brand issued a press release including a picture of Camp seated in front of the house and invited consumers to come sample new tea flavors. Nestea also partnered with three lifestyle bloggers: Inspired by Charm, Southern Bite, and Hapa Time. The bloggers selected the décor, food, and style elements of the Tiny House. They were on-site at the New York stop of the tour to share their inspiration and tips on living a modest life. Social content created by the influencers prior to and during the campaign helped increase foot traffic and brand awareness. This summer I’ve team with up with @NESTEAUSA to share simple and stylish ideas to decorate your home and perfect your entertaining skills. #ad Follow along for more creative ideas and sample the #newNESTEA at NESTEA.com. "The Tiny House embodies the ‘less is more’ philosophy, and we were excited to see consumers stop, reflect, and take a moment to enjoy the delicious new Nestea," added Ress. 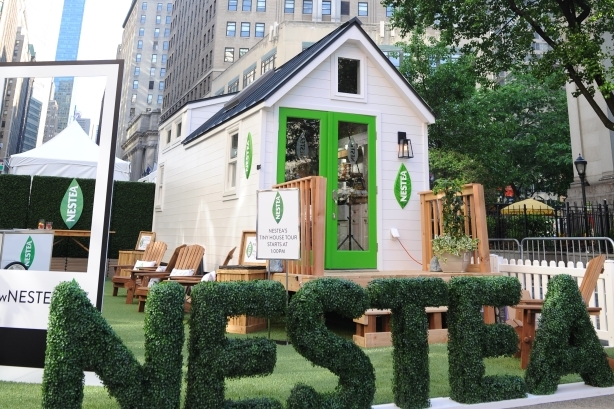 The Nestea Tiny House also visited Boston during the city's Harborfest, during the first weekend in July, and then went on to stop in Chicago on July 16. Throughout the Tiny House campaign, Nestea distributed 39,572 full-sized bottles to consumers. Using Camp as a spokesperson netted the brand coverage in Elite Daily, People.com, Time Out New York, the HuffPost, and Delish. The brand also landed feature coverage in World Tea News, Metro, TravelWireNews, and local outlets in tour cities. The three influencers tapped for the campaign drove 99,000 engagements across social and traditional outlets, measured via click-throughs, likes, comments and shares.